It is hard to believe we are heading into the Third Sunday of Advent. As our Advent reflections continue, we are able to appreciate the time we have spent waiting and preparing for this great feast. JOY naturally flows from the gifts of waiting and preparing. How have we waited and prepared? And what are we joyful about? As I go around shopping and running errands, it gives me a chance to people-watch. I have seen as many smiling faces as sad sacks. It makes me wonder what is on people’s minds as they waited in line or look for items on the shelves in crowded aisles. Recently, I witnessed a person help an older gentleman waiting in a very long line at the post office by taking the letter the older gentleman needed to mail and purchasing a single stamp. He couldn’t believe the person would do that for him. I couldn’t help but smile and whisper a prayer for both of them. The beauty of the gift of JOY is that it is always out there for us. We just need to recognize it. I have had to ask myself questions like: What am I joyful about? Am I happy when someone else is successful? Am I grateful to see the light of another day despite some aches and pains? Have I used my Advent time well? Will my preparation for the gift of Christmas bring me to a true sense of JOY? The questions go on and on. Having JOY does not mean that there is an absence of sadness or challenges; instead, JOY can come from how we handle the sadness and challenges. I dare to say that my people-watching has paid off. While at times I witness the jealously of others and lack of hope bringing others down, I also see moments when random acts of kindness, like buying a stamp for a stranger, brings such great JOY. My challenge this week is to be aware of the things that make me joyful, share that joy with those around me, and appreciate the gift of joy I witness in others. Our scripture reading this past week certainly remind us of the joy Elizabeth had when Mary came to visit her, both of them with child. Could you imagine if Elizabeth were jealous of Mary because was carrying the Savior? Some wonderful thoughts to consider for this Advent. May your week be filled with the joy you need. 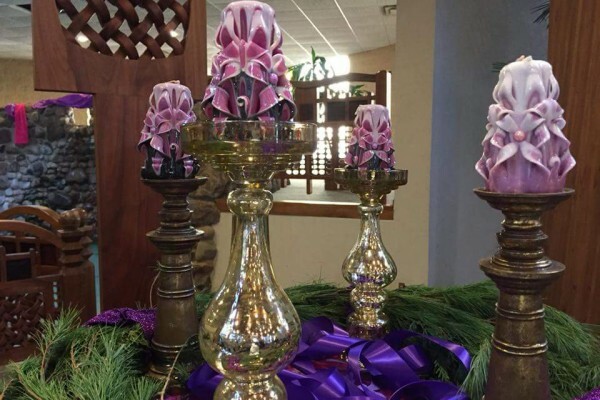 Photo Credit: Advent wreath at St. Benedict the African Catholic Church in the Englewood neighborhood of the Archdiocese of Chicago. Photo taken by and used with permission from Sr. Deborah Marie Borneman, SS.C.M.